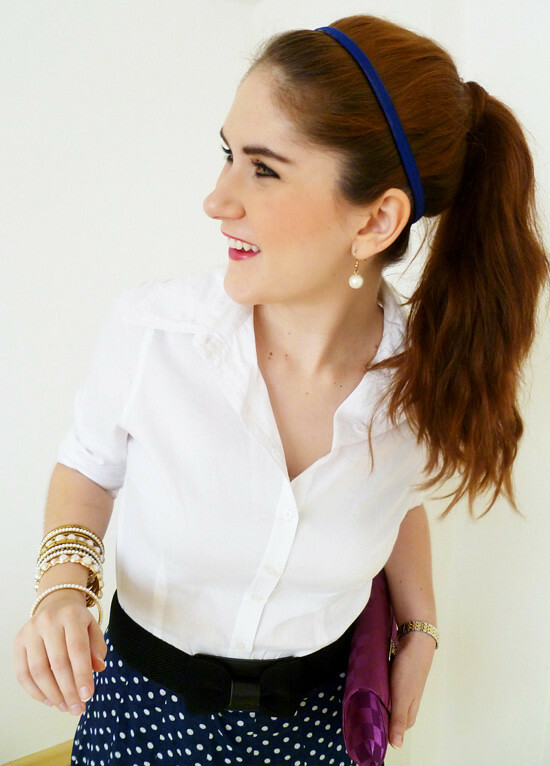 Pair your classic white button down shirt with a polka dot skirt. 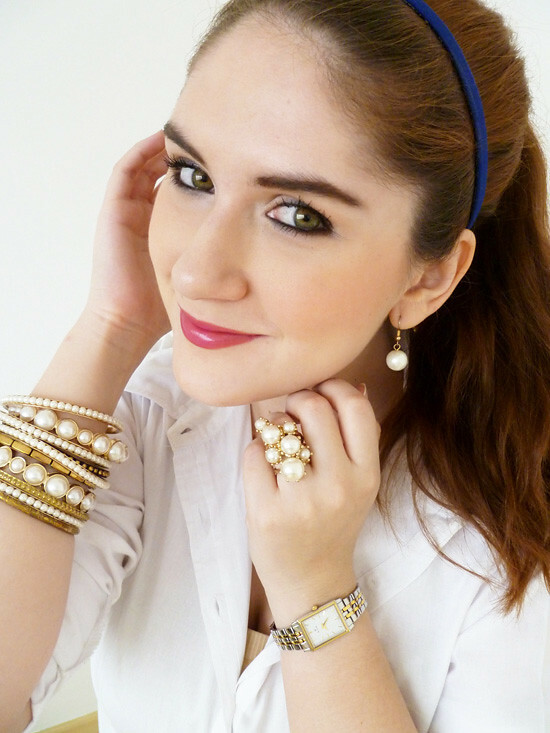 Add some navy tights, a colorful clutch, and several pearl bracelets. All done! You know those items in your closet that still fit you but you kind of don't like them anymore? You know, the ones that you kind of force yourself to wear because they are still in good condition? Well, this skirt is one of those pieces for me. Does this happen to you? What do you do with these items, keep wearing them or give them away? you made it work well. i like that blue, & all those pretty pearls. i donate things i don't like or don't wear because they are uncomfortable. So proud of you that you made it work with tights. I have lots of clothes that i consider short on me and also keep them like you do. Since i live in a tropical country, i dont have the guts to wear it with tights. But Air conditioners paired with rainy weather make it too cold. So perhaps i should adopt your idea and wear with tights too. I think the skirt is adorable and you've worn it nicely! 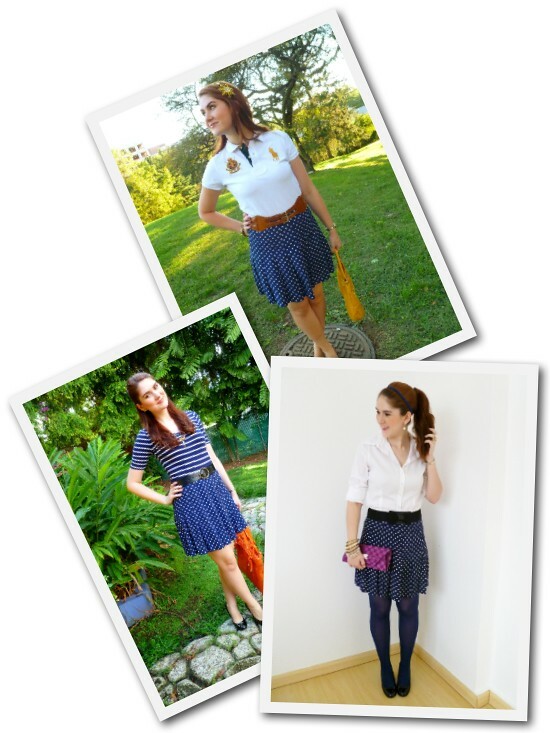 I'm on the hunt for a long polka dot skirt! And, I LOVE the skirt, wors very well with the tights! It's cute this way for sure. I usually force myself to find ways to wear it and then if I really can't sometimes it goes in the goodwill pile. once I let my hubby select which items he didn't like anymore. Sometimes I'll "refashion" an item. Loving the polka dot skirt - so cute!